You may have thought that veterinary pet insurance is only for cats and dogs. It’s true, most pet insurance is. But what about your ferret children? Veterinary visits can be quite expensive and the bills can really add up. Plus, most vets require payment up front. 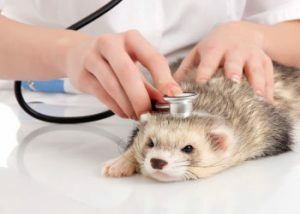 It may not be much of a financial burden for your ferret’s routine visits, but what if she gets sick or hurt? What if there is an emergency or she needs surgery or treatment for a chronic condition? I have spent thousands of dollars in vet bills within a few years due to sick ferrets. Ferret parents need the financial assistance of pet insurance too. Too many ferret parents are faced with the decision of putting a ferret down due to costly vet bills.